The observation of plaques composed primarily of amyloid-β (Aβ) peptides in the brains of Alzheimer’s patients long ago gave rise to a hypothesis that Aβ was the agent that caused the disease. The plaques themselves, composed of long, insoluble fibrils of Aβ, were believed to cause the synapse loss and nerve death characteristic of the disease, and some data supports this model. However, several experiments have suggested an alternative possibility: that the symptoms of Alzheimer’s may be attributed to soluble Aβ oligomers. In this view the fibrillar deposits may be an incidental feature of Alzheimer’s disease, or even a defense mechanism whereby the body tries to get rid of the oligomers by forcing them into insoluble aggregates. In the March 10 edition of PNAS, a team led by researchers at Massachusetts General Hospital claim to have reconciled these two models. Using fluorescence microscopy, they find that amyloid plaques are surrounded by a “halo” of Aβ oligomers that kill the surrounding synapses. The authors of this studied used fluorescence labeling to identify plaques, oligomers, and synapses in thinly-sliced tissue sections and living brains. They performed their experiments in mice that had been genetically manipulated so as to develop amyloid plaques. When they examined the brains of live mice, Koffie et al. noticed that the fibrillar plaques were surrounded by a cloud of the oligomers, as you can see for yourself in the figure below. On the left you can see the plaque core labeled by a fluorescent dye, and the middle image shows fluorescence associated with an antibody that specifically binds to amyloid oligomers. When these images are merged, the diffuse “halo” of oligomers becomes obvious. The authors see a similar result when they perform a similar experiment using thin slices of brains. The authors also used a fluorescent-conjugated antibody to identify elements of the post-synaptic density (PSD), so that they can identify healthy synapses in the brain. Experiments in tissue sections demonstrated that the number of healthy synapses was reduced not only right next to the plaque, but also in a region extending up to 50 µm away (a length comparable to the diameter of a human hair). Aβ oligomers are also enriched in this region, and the relative concentration of the oligomer roughly correlates with the loss of synapses. By comparing the pattern of Aβ fluorescence to that of the PSD, the authors determined that oligomers were associated with many synapses, and that interactions between PSD and Aβ oligomers resulted in decreased synapse size. The relationship between Aβ binding and reduced synapse size was also shown to hold in control mice expressing normal levels of native amyloid precursor protein. The observation that the presence of Aβ oligomers correlates with synapse loss, and the apparent degradation of synapses by Aβ, indicates that the soluble oligomers are a significant cause of Alzheimer’s symptoms, although this study does not rule out the possibility that the plaque itself is also toxic. Even if the plaques have no immediate toxic effect, the authors propose that they serve as reservoirs, releasing synaptotoxic Aβ oligomers into the surrounding neural tissue, increasing the size of the lesions beyond the extent of the plaque itself. In this way Koffie et al. believe they have reconciled the previous models — oligomers are directly toxic, plaques release toxic oligomers, so both can serve as causative agents in Alzheimer’s disease. If this model is accurate, it implies that Alzheimer’s disease may be quite resilient to attack. Antibodies or drugs that break up the Aβ oligomers will be effective in mitigating the synaptic damage, but as long as the plaques persist they will continue to replenish the pool of oligomers. Treatments that successfully break up the plaques will probably result in worsening symptoms due to the release of toxic oligomers as the fibrils disintegrate. These possibilities reinforce the idea that the most treatment for Alzheimer’s will involve reducing the concentration of amyloidogenic Aβ peptides to prevent them from forming plaques in the first place. NSAIDs vs. Alzheimer’s: Multiple modes of action? Loads of interesting stuff is going on in Alzheimer’s research right now. While the hot news is about a trial showing significant benefits from going after tau tangles, a recent paper in PLoS ONE continues to investigate the pathology of the amyloid-β peptide. As I’ve mentioned in previous posts, cleavage of the amyloid precursor protein to a 42-residue peptide (called Aβ1-42 in this paper) initiates the formation of peptide oligomers and eventually plaques. Recent research has indicated that these oligomers are sufficient to cause the development of Alzheimer’s disease, but the mechanism by which they do so remains uncertain. Sara Sanz-Blasco and colleagues show that Aβ oligomers disrupt calcium homeostasis in neurons, damaging the mitochondria and promoting apoptosis, and that certain NSAIDs can suppress these adverse mitochondrial effects (1). PLoS ONE is open access, so go ahead, open the article up in another window, and follow along. Although the appearance of plaques and neuronal death are classic hallmarks of Alzheimer’s pathology, the relationship between these features is not well understood. For instance, it is possible the plaques themselves kill neurons or impair neural function. However, it seems equally likely that the appearance of plaques and the death of neurons are two distinct effects with a single cause. This view is supported by the oligomer toxicity study, but that study fails to resolve the question of exactly how Aβ oligomers kill neurons. Previous work has associated Aβ with derangement of cellular calcium (Ca2+) management — a 2005 paper by Demuro et al. (2) showed that soluble Aβ induced an increase in intracellular Ca2+ in a neuroblastoma cell line. Sanz-Blasco et al. therefore decided to directly test whether Aβ oligomers were increasing Ca2+ levels in neurons, and specifically in mitochondria. In order to do this last bit they used a low-affinity aequorin targeted specifically to mitochondria. Allow me digress… to many of my readers that probably sounds like a terrible idea. If you’re trying to detect a particular chemical in the cell, it seems like the best thing to do would be to get a high-affinity binding partner. And if figuring out whether there is any calcium in the mitochondria is what you want to do, then a high-affinity detector makes sense. However, when you’re using a small amount of a sensor to detect changes in the concentration of a large amount of ligand, a low-affinity sensor is what you want. To see why, take a look at the graph on the right. This is just a rough calculation based on a situation where the detector is at a concentration of 100 µM and the concentration of its ligand (that you’re trying to detect) changes from 10 mM to 100 mM. Note that the concentration of the detector is at most 1% that of the ligand. If the dissociation constant KD of this complex is 1 mM (blue) (a lower KD means higher affinity), then the detector is almost saturated when you start, and the percentage occupied doesn’t change very much over the course of the experiment. This means that it will be very difficult to tell the difference between, say, 50 mM ligand and 100 mM ligand, because that amounts to a signal difference of 1% of the maximum response. The situation gets a little better if the KD is 10 mM (green). 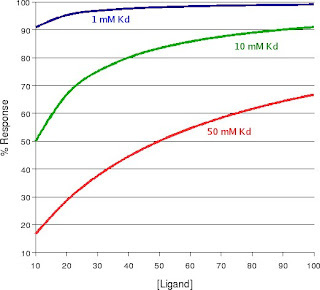 The lowest affinity detector here (KD = 50 mM, red) actually does the best job of distinguishing between 50 mM and 100 mM ligand, because the difference in response amounts to 17% of the total dynamic range. Ideally, you want to tune the KD of your detector in such a way that its response to changes in ligand concentration is large and linear over the range you are likely to be observing. For the last detector, this range lies between 10 and 40 mM of ligand, so that would likely be the ideal range to investigate with it. The precise numbers are different in the present paper, but the principle is the same. The affinity you want in your detector will depend on what you are trying to detect and the circumstances under which you are trying to detect it. In this case, the researchers are trying to measure changes in calcium ions over a fairly wide range, which have a pretty high concentration in mitochondria, and they’re doing it using a luminescent protein, which isn’t very concentrated. As a result, a relatively low-affinity detection system is best. So, what did they find? The results in Figure 1 show that Aβ oligomers and fragments cause an influx of calcium into the cytoplasm of cultured neurons, but preparations of Aβ fibrils did not cause this effect. Moreover, exposure of the cells to Aβ oligomers caused a clear influx of calcium into the mitochondria (Figure 3). This is a problem for a cell because Ca2+ overload in mitochondria can cause programmed cell death, or apoptosis. Using the classic TUNEL assay, the authors of this study showed that the Aβ oligomers caused apoptosis. In addition, they showed that treatment with the oligomers caused the release of mitochondrial cytochrome c (a step in the apoptotic pathway) and that the addition of cyclosporin A, which inhibits the release of proteins from the mitochondrion, blocked cell death (Figure 4). Together, these pieces of evidence support the idea that Aβ-induced Ca2+ influx into the mitochondria activates the apoptotic cascade, leading to neuronal death. These results are consistent with a very cool study published this week in Neuron (3) showing that amyloid plaques correlated with high neuronal Ca2+ levels in vivo (in live mice). On its own this is pretty interesting, but Sanz-Blasco et al. push it a bit further. Because they had shown previously that some NSAIDs prevent mitochondrial Ca2+ uptake in a cancer cell line, they decided to find out if they would work in this instance, too. As you can see from Figure 6, the three NSAIDs tested kept the mitochondria calcium-free, even if the cells were treated with Aβ oligomers. NSAIDs also prevented cytochrome c release and cell death (Figure 8). Some readers may recall that Kukar et al. showed that certain NSAIDs prevent oligomerization of Aβ1-42, hinting at a possible explanation of these results. However, the controls performed by Sanz-Blasco et al. show that under the conditions of these experiments the NSAIDs they used have no effect on cytosolic Ca2+ concentrations (Figure 7). If it is amyloid oligomers that let Ca2+ through plasma membranes, then this would appear to rule out structural disruption as a mechanism. Instead, Sanz-Blasco et al. propose that these NSAIDs specifically alter the polarity of the mitochondrial membrane in such a way as to prevent Ca2+ uptake. If this is true, then NSAIDs may be able to perform a double-whammy on Alzheimer’s disease. On the one hand, they appear to be capable of altering Aβ cleavage patterns to reduce the formation of toxic oligomeric precursors. In addition, they appear to have an ability to block mitochondrial breakdown and subsequent apoptosis directly. While this is encouraging, and speaks to the value of pursuing refinements of existing NSAIDs as possible Alzheimer’s treatments, this experiment doesn’t necessarily prove any therapeutic value. Even if the neurons are saved from death, the calcium flood may impair their function to such a degree that their continued survival doesn’t matter. Only clinical trials and further research can firmly establish whether current or optimized NSAIDs can provide significant protection against Alzheimer’s disease. As I mentioned in my post on the recent paper by Kukar et al., the disruption of amyloid plaques has been an ongoing focus in Alzheimer’s disease research. However, plaques and inclusions are of concern in many diseases, and as a result there is a great deal of interest in finding molecules that can either dissociate, or prevent the formation of, amyloids of many different kinds of proteins. In the most recent issue of Nature Structural and Molecular Biology there is a paper suggesting that (-)-epigallocatechin gallate (EGCG) may be able to interfere with multiple proteins that form β-rich aggregates. EGCG is a chemical found in green tea (although it is doubtful you could realistically drink enough green tea to absorb the concentrations used in this study). Previous studies had suggested that it altered the aggregation behavior of α-synuclein (αS) and huntingtin. So, Ehrnhoefer et al. use highly purified EGCG in a number of experiments to determine what effect it had on αS and the amyloid-β peptide (Aβ) (1). What these proteins have in common, besides the fact that their aggregation is associated with disease, is that the single proteins take on a β-strand structure that assembles into fibrils. Ehrnhoefer et al. find that EGCG interferes with some aspect of this process, reducing the formation of the fibrils while inducing the formation of some alternate oligomeric structure. In the case of αS, the result is a spherical oligomer (Figure 1), although the gel filtration results indicate that a large spectrum of oligomeric states is formed at lower concentrations (the trace suggests that these oligomeric forms are interconverting during elution). NMR and other data show that EGCG associates directly, but non-specifically, with the protein backbone, and that the compound has strongest affinity for the C-terminus of αS, which may play a role in preventing aggregation. The EGCG-treated oligomers had reduced β-strand content (as assayed by CD). Treatment with EGCG appeared to reduce αS toxicity in cultured cells, although this was measured strictly in terms of cell death. Similar results were seen with Aβ—addition of EGCG reduced the formation of fibrils and the toxicity of amyloids towards cultured cells. Again, the oligomers formed in the presence of EGCG could be quite large, and took a spherical shape. Based on these data, the authors propose that EGCG binds preferentially to unfolded proteins and interferes with the formation of regular β-strand structure. The EGCG-bound proteins are unable to form fibrils, and therefore EGCG oligomers compete with fibrils for monomers, slowing the formation of the latter. The net effect is to divert these unfolded proteins out of amyloidogenic pathways and into alternate oligomeric structures, which appear to be nontoxic, or at least less toxic. Can EGCG or a derivative be turned into a drug to treat Alzheimer’s disease, or a general treatment for amyloidoses? This is an uncertain proposition. As the authors of a commentary (2) in the same issue of NSMB note, EGCG’s nonspecific assault on amyloids may damage some normal structures built on this architecture. Moreover, because EGCG seems to bind unfolded regions nonspecifically, it has the potential to interfere with any of the numerous signaling proteins that possess such regions. The potential for side effects is very high, and the continued viability of cultured cells in the presence of EGCG, while reassuring, is not a particular reason to believe the compound is safe at high concentrations in the human nervous system. The promiscuity of EGCG’s interactions with unfolded regions poses another problem, in that all these proteins will act to interfere with EGCG’s action on its intended target. Fairly high ratios of EGCG were necessary in these assays, and they mostly involved purified proteins. In vivo, all unfolded proteins will act to titrate EGCG out of plasma, meaning that significant quantities of this (or any other non-specific molecule like it) would need to be used in order to achieve the desired effect. This again raises the likelihood of side effects. Of course, the most severe complication arises from the nature of amyloidoses themselves. Although the obvious presence of plaques and inclusions naturally leads us to suspect that these aggregates are the agents causing the disease, increasing evidence suggests that amyloids are merely the endpoints of some other process that is the actual culprit. In the case of Alzheimer’s disease, for instance, a recent article in Nature Medicine has provided very strong evidence that soluble Aβ dimers are the dominant contributors to Alzheimer’s pathophysiology (go check out Ashutosh’s excellent discussion of this article over at The Curious Wavefunction for more information). Now, given that these dimers do eventually form amyloid, it seems likely that they have β structure in their pathogenic form, which EGCG will probably disrupt, but this is not guaranteed. Small molecules like EGCG that prevent deposition into amyloid may actually exacerbate the problems they are meant to solve. Further research is needed to establish that the EGCG oligomers of αS and Aβ are not toxic in vivo. Diseases associated with protein aggregation continue to pose a challenge precisely because we have such a poor handle on their pathogenesis. Ehrnhoefer et al. clearly demonstrate that EGCG possesses the ability to alter the behavior of amyloidogenic unfolded proteins. While that may imply that it has promise as a broad-spectrum drug to attack these diseases, the promiscuity of its action is a cause for concern from the perspective of dosage and side effects. And, because soluble oligomers may well be the pathogenic species in many (if not all) of these diseases, our optimism about this approach must be tempered with an awareness that the actual effect of EGCG may be to enhance, rather than diminish, the toxicity of the relevant protein targets.